play a role of storage for some minerals like calcium or phosphorus. If bones may look like stones, they are living tissues continuously remodeling themselves. They are mainly made of mineralized and connective tissues, nerves, blood vessels and marrow. The constitution of bones and of the skeleton is a result of a complex process beginning in the womb. The bones’ growth is strong during childhood and continues until early adulthood. This growth phenomenon is due for about 70% to genetic factors. The bones are continuously evolving. New structure is built continuously over old bone mass, which disappears: this is the bone remodelling process. During childhood, the body creates bone’s structure faster than it does decrease and the global bone mass increases. 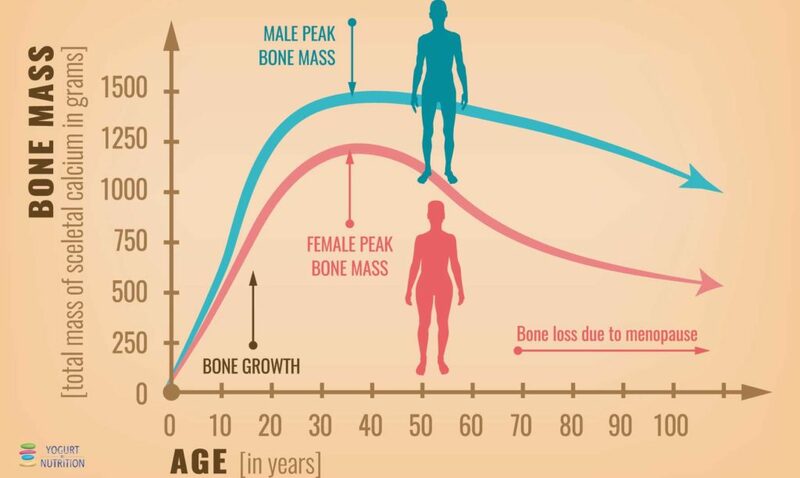 We mostly reach the peak of bone mass around the age of 30. After this age, the process of remodelling continues but we begin to lose more than we gain. The skeleton development begins at foetal stage and the maternal nutrition play already a role by stimulating bone development. During childhood and adolescence, half of our bone mass is accumulated. At this time of life, the bone building is crucial and it is a key time to build healthy habits in terms of nutritional intake and regular physical activities to assure healthy bones. Around the age of 40, we do not longer replace bone tissue as quickly as we lose it and seniors need bone thinning prevention and preservation of the muscle function to reduce the risk of falls and fractures. To support healthy and strong bones, each age group needs specific nutrients but healthy habits (in nutrition and physical activities) will remain the key driver for strong and healthy bones through life. At all ages, calcium and protein will play a key role in bone health, with particular emphasis on bone growth during childhood and adolescence, as well as the preservation of bone strength (and prevention of osteoporosis) in the elderly. How to keep healthy bones? Balanced diet and daily physical activity are key. Indeed, as bones are made of living tissue, it is essential to provide the right nutrients for strong and healthy bones. It will help stimulating bone health throughout life and preventing the risk for osteoporosis. The National Osteoporosis Foundation (NOF) released a position statement, supporting the positive effect of calcium intake and physical activity on bone accumulation, density and growth. It is especially true during late childhood and peripubertal years, considered as a critical period for bone building. Studies also pinpoint the positive role of vitamin D and dairy products consumption. Over the age of 50, postmenopausal women are at an increased risk of developing sarcopenia (a loss of skeletal muscle mass and strength) or osteoporosis because of the deterioration of musculoskeletal health. Both disorders may increase the risk of falls and fractures. Many factors may play a role and increase the risk of getting sarcopenia or osteoporosis. Those recommendations are provided by the European Society for Clinical and Economic Aspects of Osteoporosis and Osteoarthritis (ESCEO). Because the type of protein consumed impacts the anabolic response of protein synthesis, the ESCEO TASK Force also advises to consume preferentially high quality protein such as those from dairy source. Calcium is a major building block for the skeleton. 99% of the Calcium in the body is “stored” in the bones and bone serves as a reservoir of calcium that helps to maintain normal blood levels of calcium, which play many vital functions. Since calcium is not produced by the body, you must supply it through your diet and the daily recommendations have been established primarily on the basis of bone health. For adult ages 19 to 50 (70 for men), the recommended dietary allowance (RDA) is 1,000 mg of calcium per day. It increases to 1 200 mg /day for women after age 50 and men after 70. Besides, considering the physiology of the skeletal mineral metabolism, a certain amount of calcium needs to be associated with vitamin D to experience a beneficial impact on bone integrity (and to reduce the risk of hip or other fragility fracture in the elderly). Vitamin D contributes to calcium absorption from food in the intestines and bone mineralization. Calcium-rich foods, combined with vitamin D, are essential to reach daily calcium goals. Regular consumption of dairy products are part of the diet recommendation preserving healthy bones. But, studies shows that the consumption of fermented milk products such as yogurt is linked with healthy growth of bones for the youngest and reduced bone loss and lower risk of broken bones in seniors. 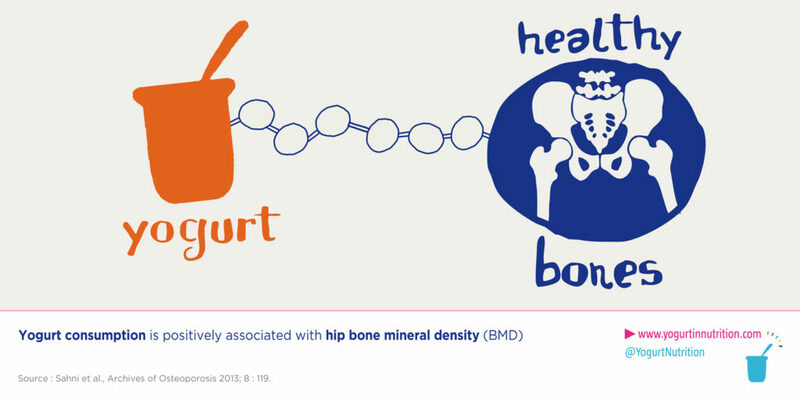 The potential for yogurt in bone strength may be due to its unique matrix associating macro and micro-nutrients with bioactive compounds. The yogurt brings high concentrations of bone-promoting vitamins and minerals that have been associated with reduced frailty. It also contains proteins, bioactive peptides, and live bacteria that may contribute to maintaining healthy bones and muscles during aging. Indeed yogurt contains live active lactic acid bacteria, which may benefit bone health by modifying the gut microbiota and increasing intestinal calcium absorption. Besides, people who suffer from lactose maldigestion or lactose intolerance, tend to avoid dairy foods, and therefore be at risk of calcium and vitamine D deficiency and risk increasing the risk of osteoporosis. For them, yogurt consumption is a good recommended alternative. Due to its live culture and fermentation process, it is well tolerated and will allow to assure the intake of calcium and vitamin D. Furthermore, yogurt is nutrient-dense and accessible food and can be an interesting way to enhance the nutritional status of older populations. Yogurt and milk research: what happened in 2016?